The Italian National Institute of Statistics (ISTAT) reports that consumer price inflation declined by 0.1% from August 2013 to August 2014. Italian consumer prices fell 0.1 percent year-on-year in August of 2014, matching preliminary estimates. The country’s annual inflation rate touched the negative territory for the first time in nearly 55 years due to a drop in energy prices. Year-on-year, prices of energy fell 3.6 percent in August, mainly driven by a 1.2 percent drop in cost of non-regulated energy products. Additional downward pressures came from food cost (-0.5 percent), mainly unprocessed food (-1.8 percent) and communication (-9.0 percent). Meanwhile, prices of services slowed (0.6 percent in August compared with a 0.7 percent increase in July). A Financial Times headline portrays falling prices as a negative thing: Deflation Takes Shine Off Sales for Italy’s Shopkeepers. The appearance of deflation in Italy suggests a worrying spread from Spain, another peripheral eurozone economy, where it reared its head this year. Deflation is now stalking the home of Rome-born Mario Draghi, the European Central Bank president, who has sounded the alarm about the need to restore growth across the continent and has taken aggressive and unorthodox measures to do so. Matteo Renzi, the youthful prime minister who gained power in February with an agenda of radical economic and political reform, acknowledged last week that growth would in fact be “around zero” this year. 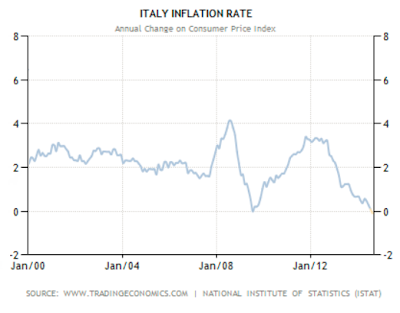 The hope is that lower prices will start luring Italians back to the shops. But policy makers – particularly Mr Draghi and other ECB officials – do not seem to be betting on the resurgence of the Italian consumer. They have been more focused on – and fearful of – the worst case: that the country, along with the eurozone more generally, could fall into a deflationary spiral, in which consumers hold off purchases in the expectation that prices will fall even further. 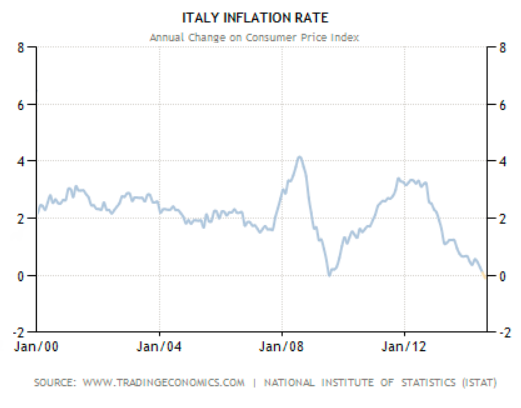 Deflation would also raise the real value of Italy’s monumental €2.1tn public debt load, causing angst among investors. “Even if you think the probability of damaging deflation is low, if it were to happen it’s a disaster,” says Erik Nielsen, global chief economist at UniCredit, the Italian bank. “The ECB was right to take out an insurance policy against it,” he adds, referring to measures including interest rate cuts the central bank took this month. The idea that falling prices are bad for the economy is ridiculous. Taking out insurance against falling prices is even more absurd. Ask any consumer if he wants lower gas prices, lower food prices, lower hotel prices, lower computer prices, or lower prices on any consumer items and the answer will be yes. Next, ask any consumer who needs a coat, computer, TV, or any other needed item if he would he wait a year to buy one because prices were falling. Assuming the consumer had enough money to buy any needed item, he would buy that item now. Thus, the entire deflationary spiral concept of consumers delaying purchases because prices are falling is ridiculous. Keynesian theory says consumers will delay purchases if prices are falling. In practice, all things being equal, it's precisely the opposite. If consumers think prices are too high, they will wait for bargains. It happens every year at Christmas and all year long on discretionary items not in immediate need. In general, people like bargains, and when bargains get big enough, people do not wait for even bigger bargains. Consider Christmas shopping. Most do not wait until after Christmas when bargains are even bigger than before Christmas. Yet, these ridiculous myths of consumers waiting because prices are falling as opposed to consumers waiting for prices they can afford have been repeated so many times that people actually believe them. People do delay purchases if they don't have a job, or the money, or they perceive prices are simply too high. The problem is typically debt, not falling prices. If consumers have too much debt or too little income they cannot buy. If businesses have too much debt they cannot expand. If governments have too much debt, they eventually run into problems. Asset prices are different. Consumers will buy houses, stocks, bonds, land, and other assets if they perceive central bank inflation will bail them out with ever-increasing asset price inflation. Eventually prices get ridiculously stretched. Then when the greater fool stops buying, bubbles burst, asset prices fall, and then debt deflation takes over. Debts cannot be paid back, businesses cannot hire, and consumers out of a job cannot shop. Keynesian economists want government to pick up the slack when businesses fail. That's nonsense. Several decades of Keynesian and Monetarist attempts to jump start the Japanese economy with nothing to show for it but debt to the tune of 250% of GDP should be proof enough. Falling prices are never the problem. Rather it's central-bank sponsored inflation that causes asset bubbles and promotes debt and malinvestment that is the problem. The solution, that no central bank cares to promote, is to not sponsor assets bubbles in the first place. Once in asset bubbles, the best thing to do is let the bust play out. Assuming Japan remains on its current path, the upcoming collapse in the Yen will provide the final proof that Keynesian economics is pure idiocy.